The textiles and dress of Gujarat in northwestern India are acclaimed for their design and craftsmanship. They play a central role in the construction of a visual identity of Gujarat and its people. 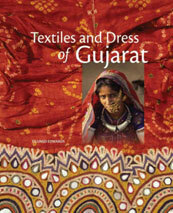 MAPIN Publishing has recently (2011) brought out a book titled "Textiles and Dress of Gujarat". This book examines the "social life" of Gujarat's textiles, tracing the historical journey of cloth and dress up to the present day. It looks closely at handmade fabrics, woven, dyed, painted and printed cloth, and embroidery, and locates their place in culture and trade. It also acknowledges the role of entrepreneurship in the survival of these handmade textiles. The sophisticated weaves, dyeing techniques, intricate embroideries, vibrant motifs and embellished dress, and the communities to which many of these are unique, have been all been the subjects of this extensive documentation. A part of the proceeds from the sale of this book goes to the Shree Dhebar Sarva Seva Vikas Mandal Anjar, an educational trust established in 1992 by the Rabari community of Kachchh to provide residential schools for Rabari children. *This is a snapshot of just one publication showcasing a valueble ICH resource of India. We are currently in the process of getting inputs and soon will be providing a comprehensive database of other such intersting publications.